First of all, who is L’Occitane? L’Occitane is an international retailer of body, face, and home products based in Manosque, France. The company was founded in 1976 by Olivier Baussan with the purpose to create a company that celebrates and preserves the traditions of his native Provence. L’Occitane means “the woman from Occitania”. Why did they use the basket bag as a promotional gift? Simple and useful, it can be used when going to the beach or the grocery store. It is made of woven wicket material which exudes a classic, chic allure and it has a soft fabric handle for maximum comfort. L’Occitane has branded its logo prominently on the bag to increase brand awareness. This will also boost brand recall every time the bag is used. Customers will be reminded to purchase L’Occitane items when they have finished consuming their current beauty products. In this way, it facilitates reminder advertising for L’Occitane. How can a basket bag affect sales? 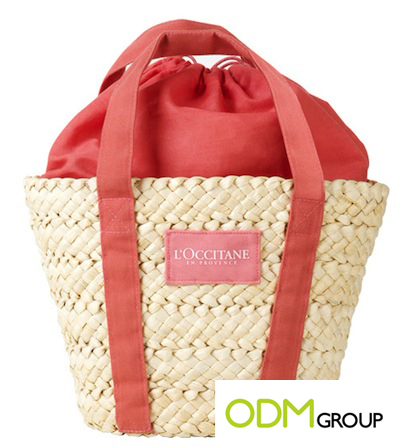 The bag is an attractive promotional product as it will definitely encourage potential customers who are browsing L’Occitane‘s website to purchase more items. They will be inclined to increase their spending to get the bag. This will spur customers into making impulse purchases and spending more. Ultimately, this will boost sales for L’Occitane. Bags make a great choice as promotional products, especially in the beauty industry. If you’re a beauty or cosmetics company, perhaps you could consider giving out bags as promotional products to your customers.